The radiating, dark green needles on Abies koreana 'Cis' lie flat on the stems and provide a backdrop for attractive, small, brown buds at the branch tips. 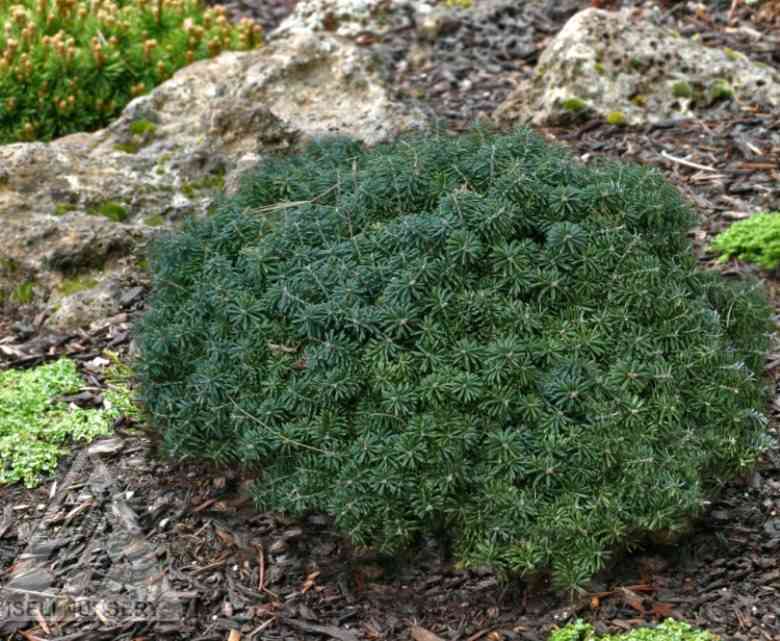 This flattened, spherical plant has a formal, tidy appearance and glistening foliage that attracts attention in the garden. It grows very slowly, about 3 cm per year. It was selected in Holland in 1989. Grow Abies koreana 'Cis' in rich, well drained soil with even moisture. All Abies dislike wet feet and will struggle in clay soils. They are generally easy to grow and low maintenance seldom requiring pruning. In our garden 'Cis 'seems to grow best with protection from the hot afternoon sun.